In 1998, the Ecuadoran painter Oswaldo Guayasamín was in the midst of his great work, the Capilla del Hombre (Chapel of Humankind) in Quito, when he created a medal for UNESCO designated to reward meritorious artists from all regions of the world. A great friend of the Organization, this major 20th century Latin American painter had previously donated five years earlier a mural that to this day adorns the entrance of the Executive Board room. When he died in 1999, he was posthumously awarded the UNESCO International José Martí Prize, a fitting tribute to an artist who had constantly shown concern for the dispossessed classes of Latin America and the Caribbean. The medal he designed was issued the same year and is now known as the Guayasamín Medal. 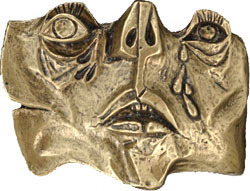 The irregularly-shaped medal follows the same style as Mothers and Children, his mural at UNESCO. 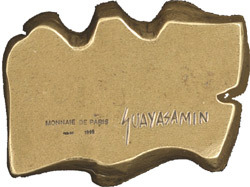 The imagery is best described by a quote from the painter himself in 1976: “I have painted for half a century as if I were crying in desperation.” On the reverse is Guayasamín's signature, with the inscription Monnaie de Paris (Paris Mint), 1999.